Hey World! We’re waiting for you. 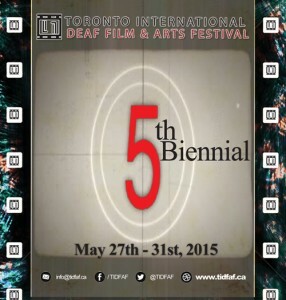 Join us in Toronto for 5th Biennial Film and Arts Festival! Toronto International Deaf Film and Arts Festival is shaping up to celebrate of emerging “Deaf Cinema” through the visual medium. We are excited to show the work the work of talented national and international Deaf, deaf, hard of hearing, deafened, Deaf-Blind filmmakers and artists as well as those who produce works in collaboration with the Deaf and hearing community. We are very proud to announce Mr. Anthony Natale and Ms. Stephanie Nogueras, as TIDFAF’s exclusive Master of Ceremony. TIDFAF is a festival committed to the celebration of diversity, Deaf culture & cinema worldwide and we are thrilled to partner with Mr. Anthony Natale and Ms. Stephanie Nogeuras. Come and join us as we recognize the vibrant culture on their work for creating an amazing film screenings to Deaf and hearing community audiences during the festival to meet the people around the world expected to gather downtown and in neighbourhoods across the City of Toronto.